↑ Ghosh, D. C.; Biswas, R. (2002). "Theoretical calculation of Absolute Radii of Atoms and Ions. Part 1. The Atomic Radii". Int. J. Mol. Sci. 3: 87–113. डीओआइ:10.3390/i3020087. ↑ Leigh, G. J., संपा॰ (1990). International Union of Pure and Applied Chemistry, Commission on the Nomenclature of Inorganic Chemistry, Nomenclature of Organic Chemistry – Recommendations 1990. Oxford: Blackwell Scientific Publications. पृ॰ 35. आई॰ऍस॰बी॰ऍन॰ 0-08-022369-9. 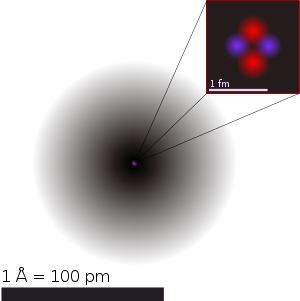 An atom is the smallest unit quantity of an element that is capable of existence whether alone or in chemical combination with other atoms of the same or other elements. ↑ Demtröder, Wolfgang (2002). Atoms, Molecules and Photons: An Introduction to Atomic- Molecular- and Quantum Physics (1st संस्करण). Springer. पपृ॰ 39–42. OCLC 181435713. आई॰ऍस॰बी॰ऍन॰ 3-540-20631-0. ↑ Woan, Graham (2000). The Cambridge Handbook of Physics. Cambridge University Press. पृ॰ 8. OCLC 224032426. आई॰ऍस॰बी॰ऍन॰ 0-521-57507-9. ↑ Jevremovic, Tatjana (2005). Nuclear Principles in Engineering. Springer. पृ॰ 63. OCLC 228384008. आई॰ऍस॰बी॰ऍन॰ 0-387-23284-2.